Jayvon Graves didn’t just sit on the bench and wait his turn to become a starting guard for the University at Buffalo men’s basketball team. And it wasn’t solely talent that made Graves into a starter. Graves was proactive about the process. He used his own time on the UB bench and coming into a game as a backup to observe and absorb everything about being a college basketball player. As he earned his minutes as a freshman in 2017-18, Graves studied his team, his teammates and what they did to earn playing time. Graves watched what his older teammates did to become successful. He prepared himself to become a significant contributor for the Bulls. The Bulls (31-3) are the sixth seed in the West region and face either Arizona State or St. John’s in a first-round NCAA Tournament game at 4 p.m. Friday in at the BOK Center in Tulsa, Okla.
Graves, a 6-foot-3 sophomore from Malvern, Ohio, has started 33 of the Bulls’ 34 games. He averages 9.9 points, 4.2 rebounds and 1.9 assists per game, and averages 24.9 minutes per game. That's more than eight minutes a game from 2017-18, when he averaged 16.7 minutes, 5.4 points and 2.3 rebounds a game. Graves’ emergence as a starter at UB parallels his development into a Division I-caliber player at St. Vincent-St. Mary. He joined St. Vincent-St. Mary as a freshman in the fall of 2013 and watched how several future Division I players practiced and prepared, including Florida guard Jalen Hudson, Louisville guard/forward V.J. King and Robert Morris guard Josh Williams. Joyce said Graves is doing the same at UB. From last year’s NCAA Tournament to this year’s NCAA Tournament, Graves said his biggest area of growth has been his emphasis on rebounding, being ready to take shots and playing defense, specifically guarding an opponent’s most potent player on the perimeter. He’s taken some advice Dontay Caruthers, his roommate and the MAC’s two-time defensive player of the year, has given him to improve his game away from handling the ball: Crowd the ball when it's in an opponent's hands, and don’t give any opponent a lot of space, even when he doesn't have the ball. “Playing off-the-ball defense is as important as playing on-the-ball defense,” Graves said. Graves has also earned the experience of playing basketball in a pressure situation. He’s played in eight elimination games in two years: six MAC Tournament games and two NCAA Tournament games as a freshman in 2018 and as a sophomore this year. He's averaged 7.25 points and 3.5 rebounds in those eight games. UB coach Nate Oats projects Graves’ role to significantly increase next year because of the experience Graves has gained in his first two seasons. “Now, he’s going to be the guy that’s been in the program the longest, outside of Davonta (Jordan),” Oats said. “And he’s going to be our primary weapon on offense. His leadership’s going to have to step up for us. 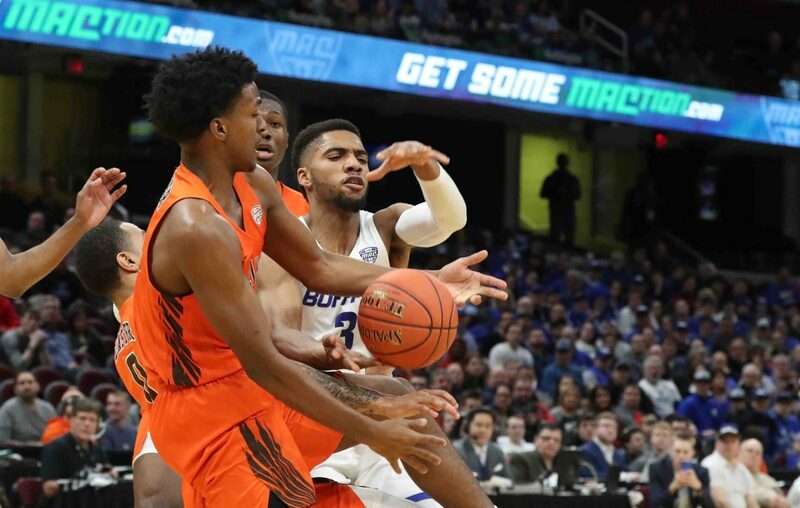 Oats has also found another area where he can count on Graves: in the late minutes of games, whether UB is hanging onto a narrow margin or widening a double-digit lead. Graves will likely start for the Bulls when they open the tournament Friday. Graves sees playing in this year’s tournament as a boost both for his experience and for what he will provide to the Bulls as a leader next season. “It will give me a different perspective, for the new guys coming in,” Graves said. “For those who don’t play as much, I’ll be able to show them my experience. “I’m not really looking too far ahead but I want to be the person that, my first two seasons I was able to experience the tournament, I want to be the person they look after, to do things the right way."